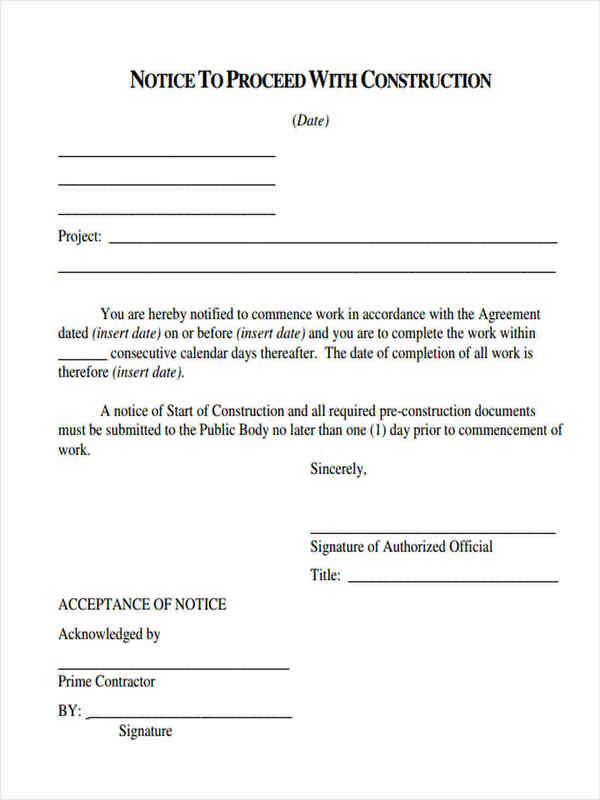 If you ever need to notify someone about the agreement of proceeding with the proposed plans for a certain project, then you will need a notice to proceed form. A notice to proceed form is basically a commencement notice in the sense that it is used to notify the relevant parties that the plans for a certain project will proceed immediately and that they will be kept up to date with the progress of the project. You may have heard that some notices require that there should be a 30-day notice attached to the notice, but that type of attachment is usually found in eviction notices and notice of removals where the person must prepare themselves for the removal of oneself from the area. What Is the Purpose of a Notice to Proceed? 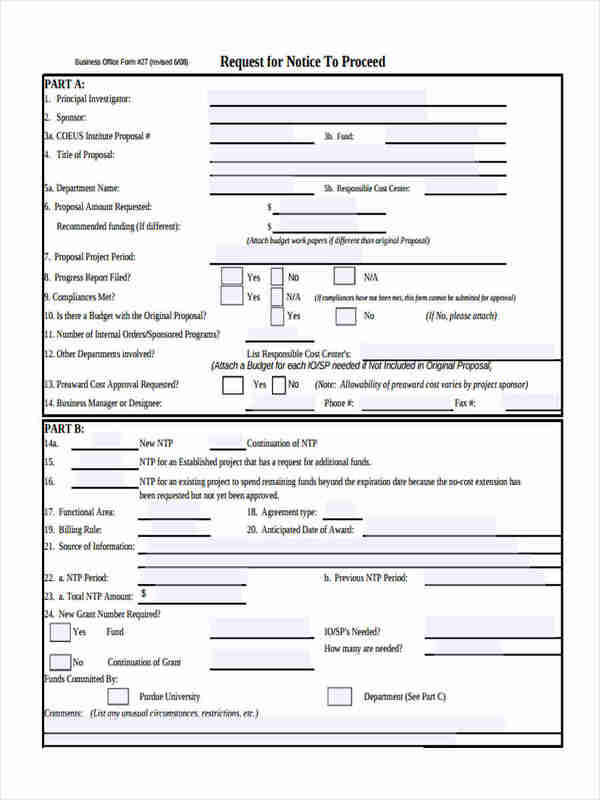 A notice to proceed, as stated above in the previous paragraph, is a type of notice form that is used to inform relevant individuals about the continuation of a certain project and or event plan. 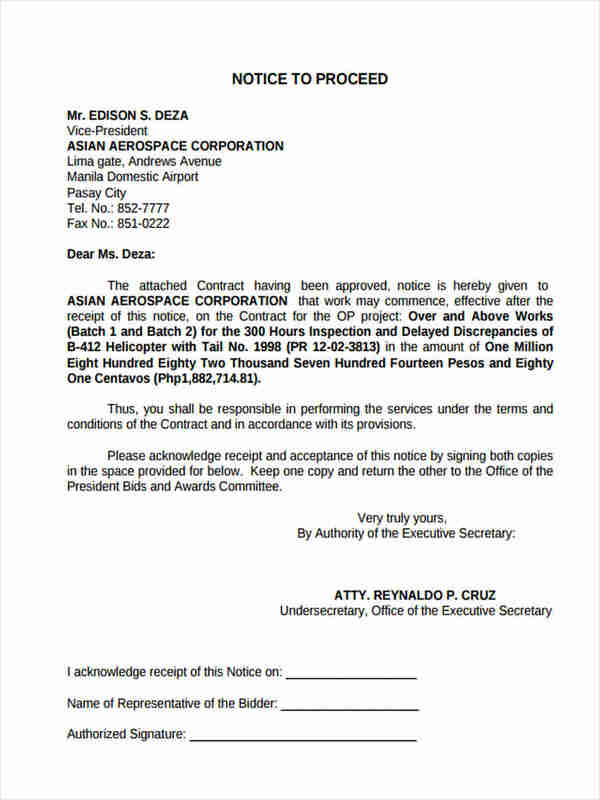 This means that a notice of proceed will be used as a means of informing people. This type of information sharing is typically used for when a person is required to share the information immediately and actively, but fails to do so because of the absence of the individual whom the maker of the notice of completion must inform. This is where the notice comes into effect, where the informer has done their duty of informing the person regardless of their presence or not. A notice of any type is useful in giving information to a person. 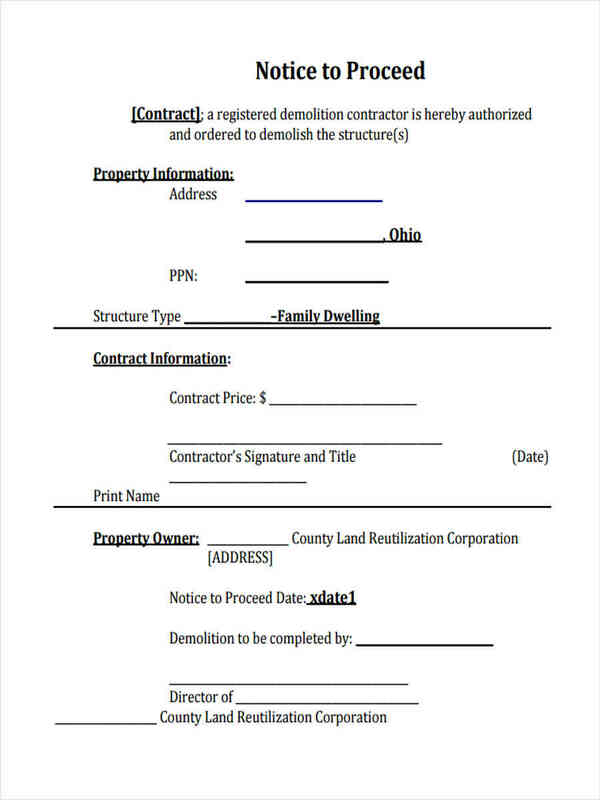 Let’s use an Eviction Notice Form as an example, this type of notice form is used to inform the residence of a certain area that they must leave the area once the 30 day preparation period (which a 30 Day Notice Form will be given to the resident) has ended. 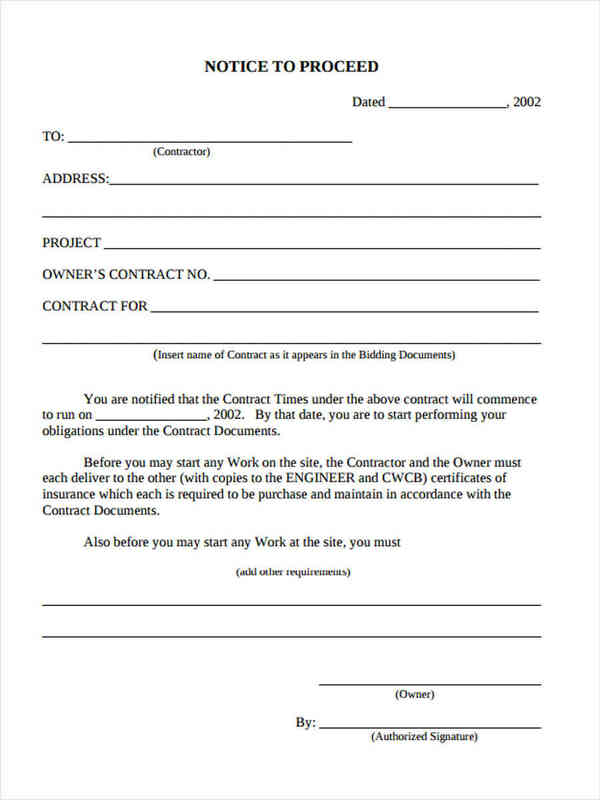 Begin with identifying the type of notice, such as identifying this letter as a notice to proceed letter. Identify yourself to the receiver of the notice to proceed letter. Identify the person or group of person who will receive the notice. Begin writing the content of your notice in the body of the letter. 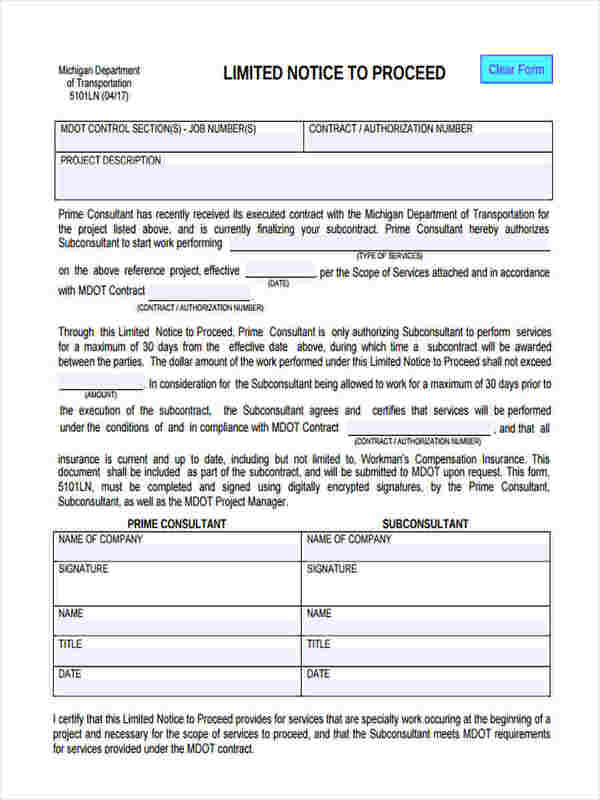 Add an area for you to sign so as to confirm the creation and submission of the notice to proceed letter. Have the notice to proceed letter notarized and signed by an attorney. When making a notice to proceed form, it is important to keep in mind that the purpose of the notice is to give a quick idea about what you wish to notify the person about. In this case, you will need to make a short summary on the fact that the plan is to proceed immediately, and that the receiver of the notice must contact you as soon as possible. Another tip would be to make the notice to proceed straight to the point and as small as possible but having the characters or words in it still visible. Always have the document notarized, and have copies of the notice as proof that you have indeed submitted it to the person whom it was made for. 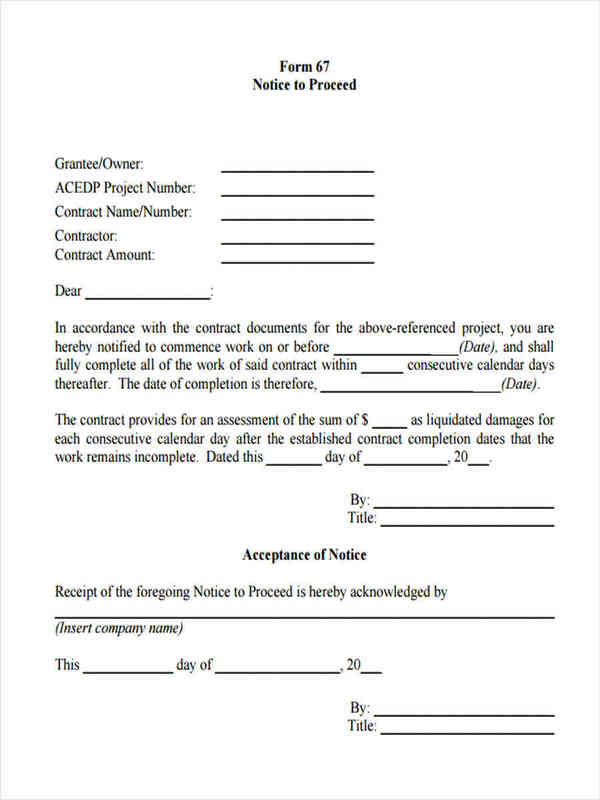 The best way to make a notice to proceed would be to use a Notice Form Example dedicated to that type of notice.